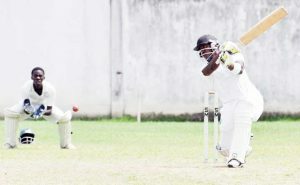 For the second consecutive weekend in the GISE Star Party Rental two-day first division cricket tournament for teams in Georgetown, two centuries were scored off the Malteenoes attack. Kevin Boodie square drives for four during his explosive 112 for Police. 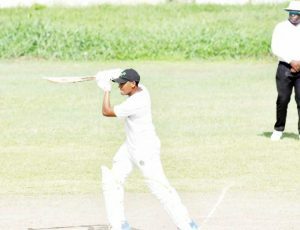 While tons from Raymond Perez and Trevon Griffith last weekend ensured DCC finished top of Zone ‘A’, yesterday’s entertaining centuries from Kevin Bookie and Kemol Savory at DCC, pushed Police into the second semi-final spot from that Zone. In the final preliminary Zone ‘B’ encounter at Everest a well-constructed 57 from Helroy Stephenson spurred UG to the other semi-final. Yesterday at DCC, MSC began the final day on four without loss and the overnight pair of Stephan Browne (22) and Nichosie Barker who reached the boundary thrice and cleared it four times in fluent 52 added 70 for the first wicket before Browne was removed by left-arm spinner Anthony Adams. But only Alex Rodrigues (12) of the other batsmen got into doubles figures as MSC catapulted to 113 all out, their last nine wickets falling for 23 runs on a soggy outfield and spin friendly track. Left-arm spinner Hemchan Persaud was the architect of destruction with 6-34 while Adams supported with 4-42 for Police which raced to 356-3 by the close on the small ground. Boodie (112) and Andrew Lyght Jnr (22) began like a house on fire and the 50 was posted in 3.4 overs. Lyght clobbered two sixes and a four off Barker’s first over which cost 17 runs as he opened the bowling with his off-spin. Lyght was caught in the deep off the expensive Barker at 57-1 before Savory, who smashed three fours and five sixes in his unbeaten innings, and Boodie whose ton was decorated with 12 sixes and five fours took the score to 169 before Bookie ran past off-spinner Shivrattan Chad who was belatedly introduced into the attack and who looked the best of the MSC bowlers. Kemol Savory drives during his elegant unbeaten 101 for Police against MSC. Adams (45) was removed by Shaquille Mosley at 246-3 as the runs feast continued while Pernell London weighed in with unbeaten 62 with four sixes and five fours as sixes rained at DCC. MSC were on the verge of forfeiting the match when they ran out of balls which were lost when they were hit over the ground and Police could have been charged with assault with a deadly weapon as their batters caused the MSC bowlers much pain in the drawn match. At Everest, TSC resumed yesterday on 49-1 and fell for 102 with Adrian Hinds (33) and Keon Morris (16) offering token resistance as Dwayne Dodson (3-12), Darrian Douglas, Dennis Haywood and Ershad Ali picking up two wickets each. Batting a second time UG made 250 with Lloyd George supporting Stephenson with 39 and Ray Newton chipping in with 28. Frauchot Duncan-Clarke followed up his five wickets in the first innings with 3-48 while Skipper Kevin Ross (3-85) and Ewart Samuels (2-19) did the damage for TSC who were 31-1 when the game ended in a draw. UG faces DCC and Police comes up against GNIC in the semi-finals which are set for this weekend.